It’s time for equity in ethnic cooking here at The Midlife Second Wife. Regular readers of the blog know that I’m half Sicilian and half Lebanese, and that I’m proud of both aspects of my heritage. But yesterday, when I was compiling an index to the recipes, which you can find at the top of the site, I was struck by an egregious oversight: Italy and Sicily are represented, but Lebanon has nary an olive or a slice of pita bread to acknowledge its treasured place in my lineage. That changes today. I’m proud to share with you two recipes that, when combined, create a whole that is deliciously greater than the sum of its parts. I’m talking about Kibbee Bis-Sayniyyi, or Baked Kibbee. My Grandmother Abookire prepared kibbee regularly, along with other wonderful dishes such as tabouli, homus, stuffed grape leaves, and kousa. I also have sublime memories of her baking, in her basement summer kitchen, what we now call pita bread, but which she called Syrian bread. The aroma filled the old, American Foursquare house. Sittoo (Arabic for Grandmother) employed an assembly line technique: the small, round discs of dough, having adequately risen, waited beneath kitchen towels on a long folding table for their turn in her antique Magic Chef gas oven. Using a worn, long-handled bread paddle, she pulled the piping hot loaves out of the oven and set them on a separate table. At this point I’d make my move: I’d grab a hot loaf with a spare towel, carry it upstairs to the main kitchen, slather it with butter, and settle on the front porch glider. There, in a carbohydrate-comfort food-stupor, I’d watch the summer traffic roll by on Route 20. After Sittoo and Jiddu, my grandfather, moved from Ohio to Southern California, she would write to my mother and me regularly n her spidery, upward-slanted hand—often including some of her recipes. Her command of English was remarkable; she and my grandfather had been born and raised in Lebanon, but she was educated at American Christian schools. Nevertheless, I found it difficult to decipher her instructions. To compensate, over the years I’ve acquired substitute recipes that are just as delicious. (In truth, the ingredients and methodology are fairly universal.) I do believe, though, that watching her cook during those impressionable early years left their imprint on the way I squeeze water out of bulgur and use my hands to assemble tabouli. Or maybe all of this is simply embedded in my DNA. These recipes are from a wonderful cookbook compiled by members of St. Anthony’s Maronite Catholic Church in Glen Allen, Virginia. I purchased the cookbook at their annual Lebanese Food Festival, held each May on the church grounds. In fact, the festival was the first place John took me during my first “official” visit to Richmond. If I was thrilled to discover that a thriving Lebanese community existed in what would soon be my new hometown, imagine my delight when I tasted the food! If you live in or near Richmond (or plan to visit), mark these dates on your calendar: the 28th Annual Lebanese Food Festival takes place May 18 through 20, 2012. You can visit the church’s website for more information. My thanks to Father George for giving me permission to include these cooking instructions, ever-so-slightly adapted, from Timeless Lebanese Recipes. Brown the pine nuts in butter until golden. Then add meat, onion, and spices. Sauté for 10 to 12 minutes. Recipe may be increased if more filling is needed. After preparing this, I keep it in the refrigerator, in a covered bowl, until I’m ready to use it later that day. With a sharp knife, score the top layer 1/2 inch deep in a diamond-shaped design 1 inch apart. Pour a bit of canola oil across the top. Bake in a 400-degree oven for 25 minutes. Lower the heat to 300-degrees and bake for 20-30 minutes more. The baked kibbee should be golden brown. When serving, cut along the diamond-shaped wedges. *Important: When smoothing the layers of kibbee by hand, keep dipping your hands in cold water so the kibbee will not stick to your hands. Smooth well. I like to serve this with rice pilaf and tabouli. (I’ll share my recipe for tabouli with you at a future date.) Don’t forget the pita bread. Sadly, I’ve never tried to bake my own. I should; there’s a recipe for it in the church’s Timeless Lebanese Recipes! If I do, you can be certain I’ll let you know. I am from (Massillon/Canton)Ohio – your recipe is exactly like my family!!!!!!! For Christmas dinner, is making my family a Lebanese meal. Searched for baked kibbee online and found your site with the photo looking exactly like what my Mom’s creation looked like. Then, I read your recipe and blog about it. OMG…thought I had written it…from pita bread reference and calling it Syrian bread, to pulverizing the onions and lamb mixture together, mentioning the meat grinder affixed to the table! But when you referred to Route 20, I had to write you. You see, I grew up in Ashtabula where Route 20 continues east. So happy I found your site. Thanks for the memories for me, and true-to-home recipe foe kibbee. Thank you from the bottom of my heart for sending me one of the best comments I’ve ever received! I love that you found my recipe, and that it kindled so many warm memories for you. Here are a couple more coincidences for you….my closest cousins growing up, who lived on Route 20 in Elyria, moved to Southern California when we were all kids…saddest day of my life up to that point. And my mother was from Lorain, Ohio. Enjoy the kibbee, thanks for following the blog, and Merry Christmas! What a great reply, Marci. How special to hear from you. Kibbee for Christmas, along with grape leaves and tabouli and labne! Merry Christmas. Thank you for sharing the continued similar coincidences (not sure if that’s redundant) of our lives. I’ll keep reading your blogs. Take care, Lorraine from partly cloudy, 71-degree San Diego. 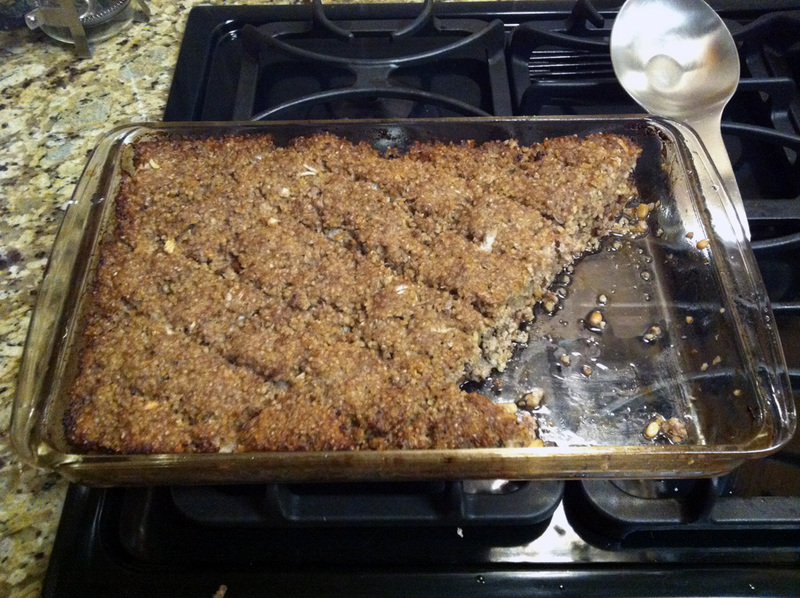 Thank you for posting your recipe for baked kibbeh. I love Lebanese food. This is exactly the way my family has always made it, except we used butter instead of oil. My father was Lebanese, Syrian, My Mom was all Italian. My Mom’s Meshee Grape leaves, Cabbage and Kousa was the best. Im not as good of a cook as Mom, my aunt’s and Brother were, but I try. Both of my Parents were first veneration American. My father’s great uncle,, Bishop Shebay founded St. Maron’s in Detroit, and several other Maronite Catholic Churches in the United States. There is nothing better than homemade Lebanese and Italian food!! !……..Marie K.